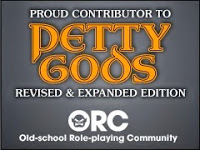 I am of the opinion that there are two main reasons why a publisher would put something up for free on DriveThruRPG. The first is simply because they want to get their product "out there" and DriveThruRPG is a great distribution platform. The second, and often more compelling, reason a publisher puts product up for free is so you'll try it and then go back to purchase more of that publisher's offerings. I specifically went looking for some free maps that I could review and the first thing I downloaded was supposed to be an example of the artist's/publisher's work, but I hated it. The download was simply two .jpeg maps, one of which had some garish overlay on it. Now I'm certain that the "regular" offerings from this publisher were pretty good as I'd looked at their homepage, but as an example of work, the free download wouldn't come close to convince me to plunk down some cash towards other map packs. 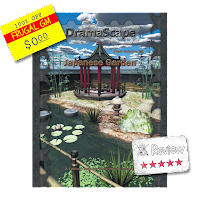 The Japanese Garden, from Dramascape.....180* out from the first map maker I checked out. I was pretty much blown away by the quality of this download. I thought I was just getting a simple Virtual Table Top (VTT) map, and my curiosity was piqued when I noticed the download was almost 20 MB. My initial thought was something along the lines of, "Damn...that must be one huge map!" The map was a good size, 20" x 21" at 100 DPI, but the rest of the download consisted of a PDF and another file. Before I briefly go into the PDF, I want to note that I am not going to mention this other file because I want for you to have the opportunity to look at page 6 of the PDF yourself (please do this first) and experience the awesomeness that is this free download. I went from looking at the VTT map first and then the PDF and I'm glad I did. .....anyway, back to the PDF. The VTT map is given a high-res treatment in a couple different ways. First there is an overview map that is basically the same as the VTT map, nothing too special. Then comes the surprise on page 6. The rest of the PDF is the map laid out three different ways: hex grids, square grids, and no grids at all. While I think they could have accomplished the grids easily with a layered PDF, I often find it just as easy to print out just the pages I want from a larger PDF without having to play with options. If you are taking the file to Kinkos for professional printing it is far easier to tell them to just print pages 19-24 than have to go through the "fun" of asking them to play with layers. and a quick & easy "print these pages" for a specific grid layout along with a page number map showing the proper layout. These two things may be little things, but it is a great professional touch that takes almost no effort on their part to head-off possible headaches on my part. I don't know about you, but having to flip through the pages of a PDF and write down which pages to print off and then have to open up the PDF again after it is printed to make sure I have the layout right can be a pain. Maybe not so much with an easy six page map, but some larger maps get problematic. This level of detail on a small free product also hints at what Dramascape puts into their larger products. 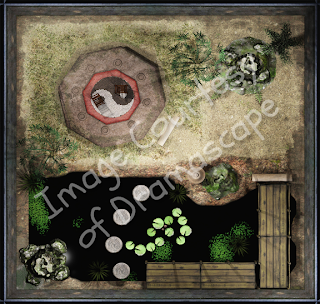 Now if I haven't sold you yet on picking up this map, then maybe you'd be interested in the large assortment of other free maps that Dramascape has made available. I think you'd be hard pressed to not find some free and/or some inexpensive Dramascape maps that are to your liking. 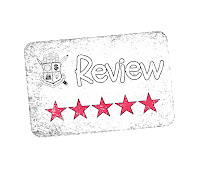 I can see why some of their products are best sellers....and I think you will too.